The lionfish, with its striking russet and white stripes and huge venomous outrigger fins, wasn’t hard to spot under a coral reef in 15 feet of clear water. Nor was it a challenge to spear it, as Christopher Pala reports in this article for the Inter Press Service. As I approached and brought the point of my Hawaiian sling to within a foot of it, it simply looked back, utterly fearless until I pierced it and brought it back to the surface. Within a half-hour, we had caught four of these gorgeous one-pound fish, and the fillets made excellent eating that night. But the arrival of a tasty, abundant and easy-to-shoot fish on the Caribbean’s much-depleted coral reefs is anything but good news. A recent scientific paper brought new detail to previous studies, showing that a year after colonising a reef, lionfish reduced the number of native fish by about half. “They’ll eat just about anything they can swallow and almost nothing eats them,” said principal author Stephanie Green of Oregon State University. That’s why they’re so easy to catch, she explained. However tasty they may be, only a miniscule fraction of the invaders has been removed, while their numbers continue to grow exponentially, reaching densities never seen in the Pacific, their native habitat. This suggests the lionfish, believed to have been introduced to the Atlantic coast by aquarium lovers in the 1980s, will likely wipe out most Caribbean reef fish in a decade or two, scientists agree. As a result, many corals that depend on herbivore fish will die and eventually turn to rubble, making shorelines more vulnerable to waves just as global warming is lifting sea levels. Maillis, a lifelong fisherman, conservationist and a former president of the Bahamas National Trust, has been trying to promote a commercial fishery in The Bahamas, but the fish, first spotted here in 2004, has become nearly ubiquitous since 2010. And shooting it while scuba diving is still banned. His pessimism is not unwarranted. Scientists from the southern Caribbean are reporting seeing densities of lionfish that until a couple of years ago were only documented in The Bahamas, the fish’s jumping off point from Florida into the Caribbean. In addition to adult little reef fish, the lionfish swallow virtually all species of bigger fish when they appear on the reef as bite-sized juveniles. No so for the larger predators like snappers and groupers that are the mainstay of the local fishermen’s reef catch. A stroll along Nassau’s fishing docks confirms what scientists have observed: despite the explosion in the number of lionfish, the decades-old slow decline in the numbers of large predators has not accelerated – yet. Because they take years to mature, it will take a while for the generation of juveniles that’s being gobbled up now to fail to replace the current adults, who are too large to be lionfish prey. At Nassau’s waterside fish market, where a “Me? Worry?” mood prevailed, fisherman Carson Colmar, 45, said he’s not seen any significant drop in his catch of reef fish and lobsters. He started spearing lionfish simply because they’re so easy and abundant. “I sell 50 a week,” he said. “I’d catch more if I could sell them.” The fillets sell for eight dollars a pound, compared to twelve dollars for grouper or snapper. One problem is that handling lionfish requires special care: some of their fins are tipped with venom that make even the slightest puncture extremely painful, though not fatal. So local people, already taken aback by their unusual appearance, often believe that the flesh may be poisonous too, which it is not. That, fishermen complain, limits demand. In the United States, the notion that this lethal predator could be controlled by becoming dinner for the ultimate predator, homo sapiens, has received wide coverage. Lad Akins, the founder of REEF, the Reef Environmental Education Foundation, who has been working on lionfish control for nearly a decade, noted that the commercial take of lionfish in Florida, where REEF is based, quintupled in just a year to 6.1 tonnes in 2012. “It’s growing fast, but we don’t know yet if it’s putting a dent in the lionfish population,” says Akins, who is based in Key Largo. 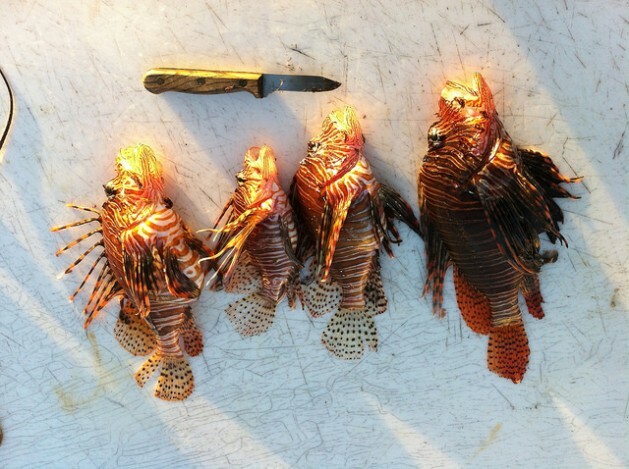 Scientists said the strategy of “eat them to beat them” has failed to have any overall effect and is unlikely to do so because spearing lionfish is too time-consuming to be profitable. So far the only documented successes have come from recreational diving companies, which are literally defending their turf. Seeing how the colourful reef fish that underpin the businesses could soon be gone, they have started methodically exterminating the invaders from their regular dive sites. In Bonaire, a diving mecca the Dutch West Indies, the first lionfish was caught in 2009, and within two years they were proliferating, according to Fadilah Ali of the University of Southampton. But some 300 volunteers were given special spears, more than 10,000 lionfish were killed and soon their density dropped in the areas favoured by divers. “Today, on a typical dive, you’ll see very few or no lionfish,” she said. Green of Oregon State said some reefs might survive if the recreational divers go beyond the reefs favoured by their clients, which tend to have many different species but few juveniles. To protect the young fish, they would have to eliminate lionfish from shallow areas around mangroves, which serve as nurseries, she said.